Lake Michigan beckons you to its golden beaches and spectacular sunsets, a guaranteed evening event! The magnificent Manistee National Forest stretches for miles and is a nature-lover's paradise. Here, wildlife is found in its natural habitat, and recreation activities include camping, hiking, and biking. Nearby scenic rivers offer opportunities to fish, canoe, or kayak. 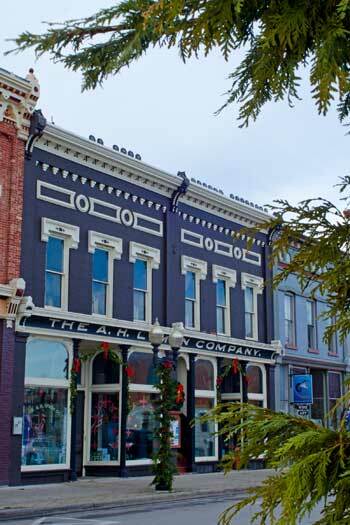 Visit downtown Manistee, a destination known as the Victorian Port City. Spend time browsing the shopping district, satisfy your hunger at one of the exceptional restaurants, then get some exercise on the Manistee Riverwalk. Mileage markers have been placed every tenth mile to gauge your distance, and the view along the 1.5 mile Riverwalk makes your trek so much more enjoyable. You can appreciate the history of Manistee when you see the architecture throughout the city, especially the Ramsdell Theatre. Here is where James Earl Jones got his start, and it is still the venue for area theater productions. The S.S. Milwaukee is a 77-year old Great Lakes ship, permanently moored in Manistee. It is open for tours, and during October, transforms into a Ghost Ship for the Halloween season. The elegance of this port city makes Manistee a perfect wedding destination. Whether you choose the beach or a historic building, Manistee.LakeshoreCelebrations.com has listings for area photographers, DJ's, caterers, halls, florists and more. This website was designed to help in the planning of your special event.